An accent wall is a popular way to spice up any room in your house or office. An accent wall is one wall within a room that is painted a different shade or color than the other three walls in that room. The wall that is accented is usually the first wall that is seen upon entering that room. An accent wall can be used to highlight a large focal point on or near that wall (tv, entertainment center, bed, fireplace, bookcase). 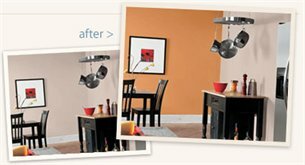 In most cases, an accent wall is a bold color i.e., orange against neutral walls i.e., white. Or a vibrant shade against other walls of the same shade, i.e. a rich orange against other, very pale orange walls. 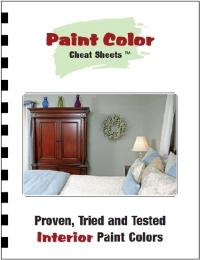 Brighten a room, enhance a design, or set off photographs of friends and family members. Visually enlarge or shrink a room, pull together a room’s design or make a bold statement in any room of the home. Cool colors, such as blue, green or gray recede from the eye; using a cool color on an accent wall of a small room, will visually enlarge the room. A kitchens backsplash wall is a perfect place to put an accent color to liven up the kitchen. The back wall of a built-in bookshelf painted in a contrasting color will highlight your books and accessories.